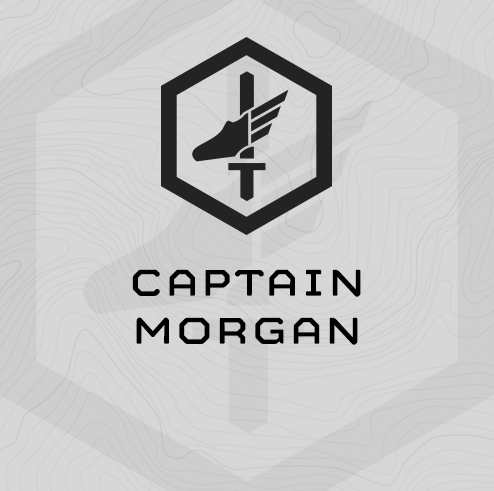 Captain Morgan is an intense, 6-Week, 5 day/week training cycle. This is third plan in the Pirates Packet of training plans designed as day-to-day programming for tactical athletes whose mission-set includes water-based activities such as SCUBA and water rescue. Captain Morgan trains water fitness in conjunction with the other land based fitness demands for the multi-mission tactical athlete. This plan was built in June, 2017. Aerobic base swimming, building up to 2,500m swim at moderate pace. Super Squat strength focusing on the Back Squat and Bench Press. These are brutal! 15min + 10min work capacity efforts with short rest periods between. Gym based, multi mode efforts, including a step up progression, shuttles, mini leg blasters, sand bag get ups, etc. 6 Mile run assessment with follow on 2-mile intervals to train speed over ground. Focus on tactical speed and agility – linear speed, level and direction change, trained unloaded and loaded. Chassis Integrity is trained 1x/week with a 15-20 minute “ARTE” circuit. Training sessions are designed to last 60-75 minutes. Make one and take it to the gym when you train … a sandbag (40# for women, 60# for men) is required for this program. We sell sandbags at mtntactical.com, other venders sell them, and you can make your own. Be resourceful. Parts (2) and (4) aren’t fun. Expect shaking legs and arms near the end of the 20 reps.
20x Back Squat @ 70% 1RM. 20x Bench Press @ 55% 1RM.